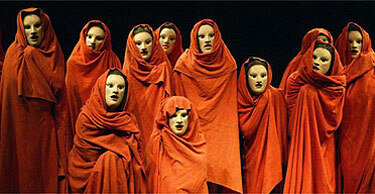 For your final project for Antigone, you and a partner will be creating a Fakebook page for one character in the play. Go to this site: Fakebook. Fill in the name, profile information, and friend list of your character. SAVE your page. If you don’t save it, it will just disappear and you can’t access it again. Once saved, you will be given a unique link which you must copy and paste into the shared Google Spreadsheet. This is due on MONDAY, the 29th. You just need to have it set up. We will begin posting up to the page after that. Let me know if you are having problems with this, but also check back here for instructions on how to set it up. Develop your character with your partner. Fill in the friends list, your profile description, and 2 detailed, interesting posts about what has happened so far in the play. Use your imagination and get creative! What are your character’s motivations and inner thoughts? Develop your character’s back story. Use method acting techniques to get into character. What is your character’s favorite song? Movie? Food? Color? Animal? Celebrity crush? and Book? Fakebook: 90 second tutorial from History Teacher on Vimeo. This article was written on 25 Apr 2013, and is filled under Homework Assignments, In Class.